You should reduce your intake further to 1500 mg per day if you are in any of the following population groups who have been shown to be more susceptible to sodium’s blood pressure-raising effects. Prepare your own food when you can. Don’t salt foods before or during cooking, and limit saltshaker. 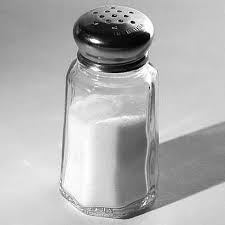 Only a small amount of the sodium we consume each day comes from the salt shaker. Add Flavor Without Adding Sodium. Use herbs and spices instead of salt to add flavor to your foods. Get FRESH when you can. Buy fresh or frozen (not processed) poultry, pork and lean meat rather than canned, smoked or processed meats like luncheon meats, sausages and corned beef. Fresh foods are generally lower in sodium. Watch your veggies. Buy fresh, frozen (without sauce), or low sodium or no-salt-added canned vegetables. Give sodium the “rinse.” Rinse sodium-containing canned foods, such as tuna, vegetables, and beans before using. This removes some of the sodium. Examine your dairy products. Choose fat-free or low-fat milk and milk products, such as milk, yogurt, cheese and fortified soy beverages (often called soymilk). Choose “Unsalted” snacks. Choose unsalted nuts and seeds, and snack products such as chips and pretzels. Consider your condiments. Sodium in soy sauce, ketchup, salad dressings, and seasoning packets can add up. Choose lite or reduced sodium soy sauce and no-salt-added ketchup, add oil and vinegar to a salad rather than bottled salad dressings, and use only a small amount of seasoning from flavoring packets instead of the entire packet. Eating Out: Choose a lower-sodium option. Ask for sauces and salad dressings be served “on the side,” then use less of them. Reduce your portion size – less food means less sodium! For example, ask the server to put half of your meal in a take out container before it comes. Start today in taking small steps that can have big results for good health!